2x Opti-Foil™ for perfect closeness that lasts longer. ActiveLift trimmer captures flat-lying hairs in problem areas. Protective SkinGuard, smoothens the skin for an exceptional shaving experience. 8-D Flexible Shaving System, the 8 directional flexible shaver head masters even the most problematic contours. With individually floating foils and trimmer, mounted on a pivoting head with Micro- and MarcoMotion. Skin contact as close as 0.05mm. MacroMotion, 40° pivoting shaver head effortlessly navigates along larger contours for maximum skin contact. MicroMotion, individual suspension of all cutting elements responds even to the smallest contours. 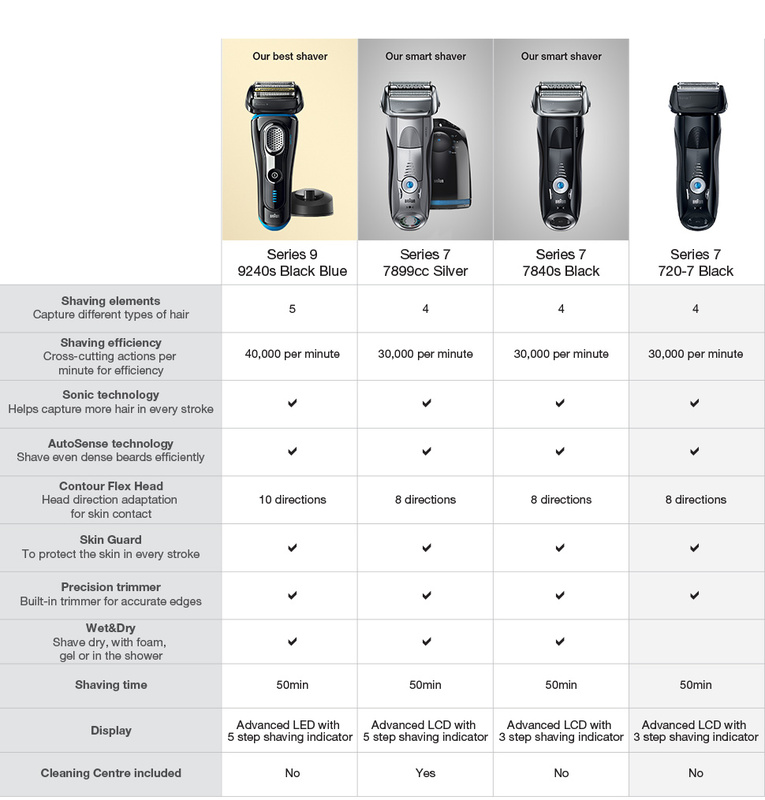 Series 7 Electric Foil Shaver Black is rated 4.4 out of 5 by 51. Rated 5 out of 5 by jimbo from silent -smother i took up electric as my age increased ..the old skin was not as tough as !!!! But what a beauty cut shaving time time down AND the lady dont get the dreaded Rash !! Rated 5 out of 5 by Smiley from Easy to hold I have always used a Phillips shaver thought they were the best since finding out what it was going to cost for new shaver heads I decided to try the braun series 7 the best move ever made smooth and no red bloches after shaving only had it for one month now but I’m really impressed with it. Yes it is and it gives a very close shave. Like velvet my wife says. Is a charging station included with this item. Braun Shaver Series 720s Replacenent head. Available ? Does this razor come with a cleaning Station? What else is in the box?